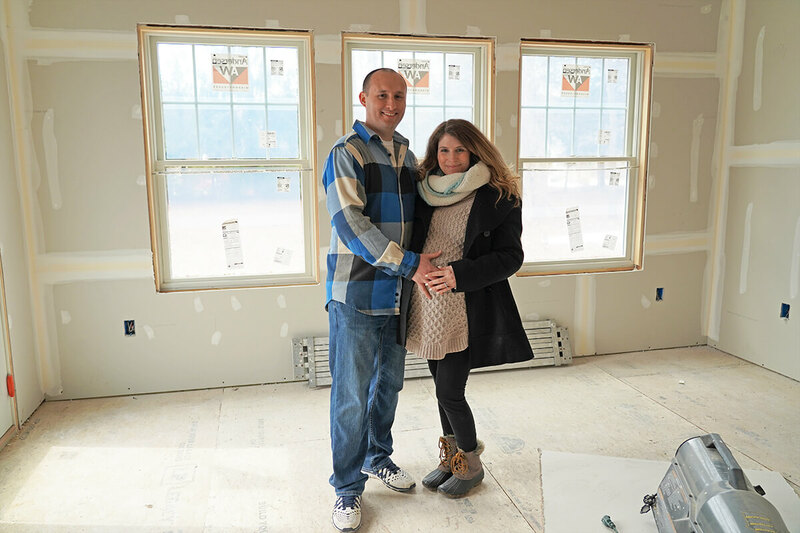 While building a home from essentially scratch is really amazing — you get to have a hand in every design decision that goes into it — it’s also overwhelming, especially for someone like me who has a difficult time making definitive decisions ([insert husband eye roll here] because I’m great at thinking I’ve made a decision). 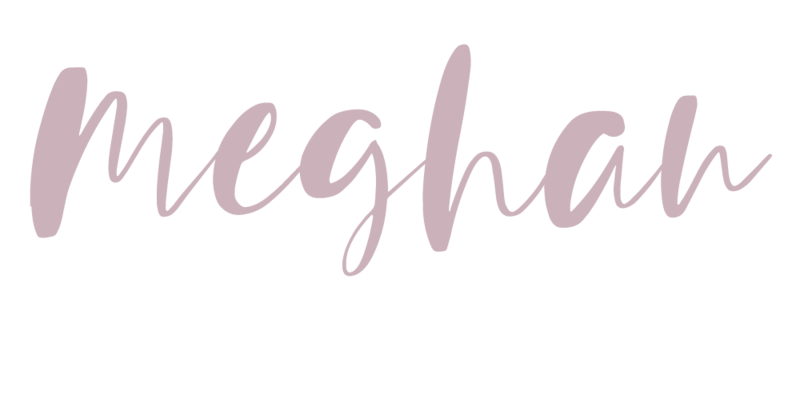 Throughout this process, I’ve walked into many different types of stores — tile, stone, countertop — and have easily declared, “That’s the one!” However, once I go home, my mind begins to wonder whether I made the “right” decision. Then I have to go back several more times to each store just to make sure I’ve exhausted all of my options. Hence, I’ve been experiencing a major case of decision fatigue … and I now understand why interior designers are so invaluable. I will say, in at least one case so far, questioning our initial choice has paid off, and that’s with the Thinstone on the front face of our porch. 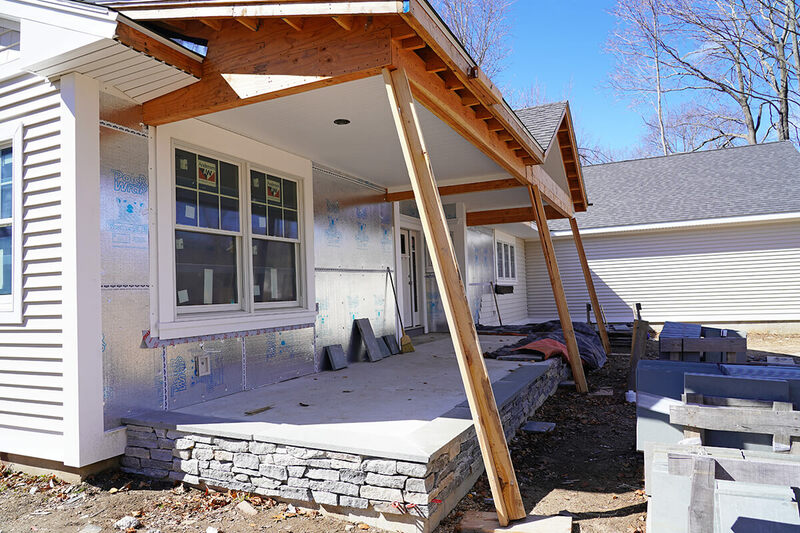 Initially, we chose a mostly gray stone, but then I wondered whether we needed something that incorporated warmer tones (while gray is “in” for both interiors and exteriors, I’m always afraid of things being too cool). Brooklawn Blend Thinstone in a ledge cut on our front porch. So after a couple of more trips to look at other options, we made a new decision — the Brooklawn Blend from O&G Industries in a field stone cut — and it looks beautiful. 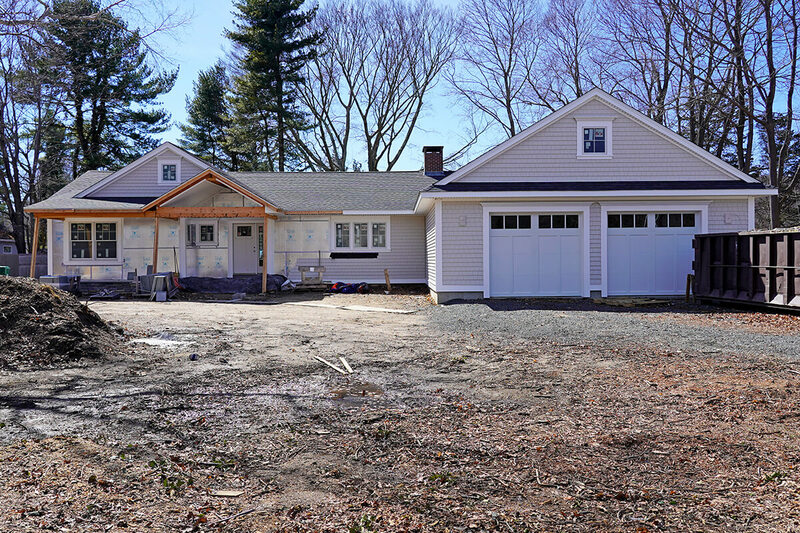 It pulls from the warmth of our Herringbone colored siding from Certainteed, as well as the coolness of the slate that sits on top of it, and our darker roof. 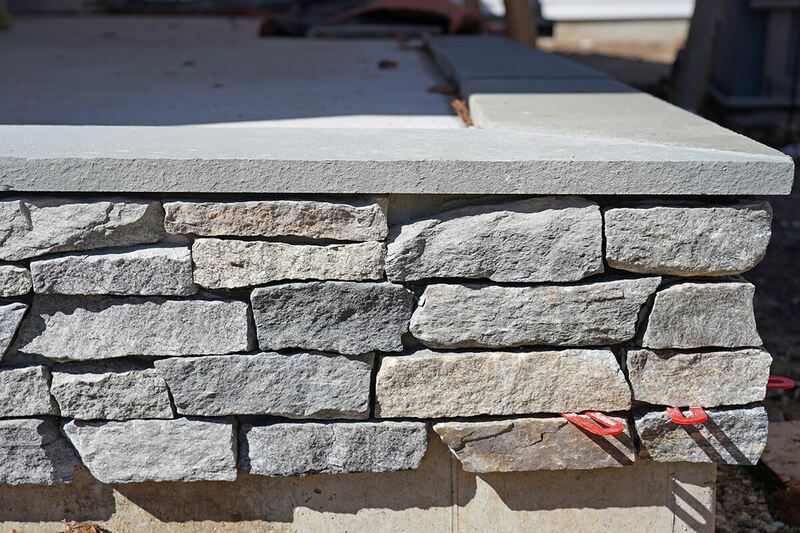 Also, since the ledge cut involves narrow stacked pieces of stone (versus an Ashlar or Mosaic cut where you see more surface area of each stone), the varying grays and warmer hues are nicely dispersed. Brooklawn Blend Thinstone in a ledge cut, topped with slate. Another design choice that really bogged me down was the countertop for our kitchen. You really can’t make a choice based on a small 12″ x 12″ sample … It’s imperative you see a full slab to get the total effect. However, tracking down slabs isn’t always easy. For example, after coming across it online, I thought I was set on Silestone’s Eternal Calacatta Gold. It’s a white quartz with warm veining throughout. But the closest place I could see a full size version of it was outside of Boston at a place that’s only open Monday through Friday. Since I work fulltime, not so easy. But my mom and I made the two-hour trip on a day I took off from work, and I’m so glad we did. 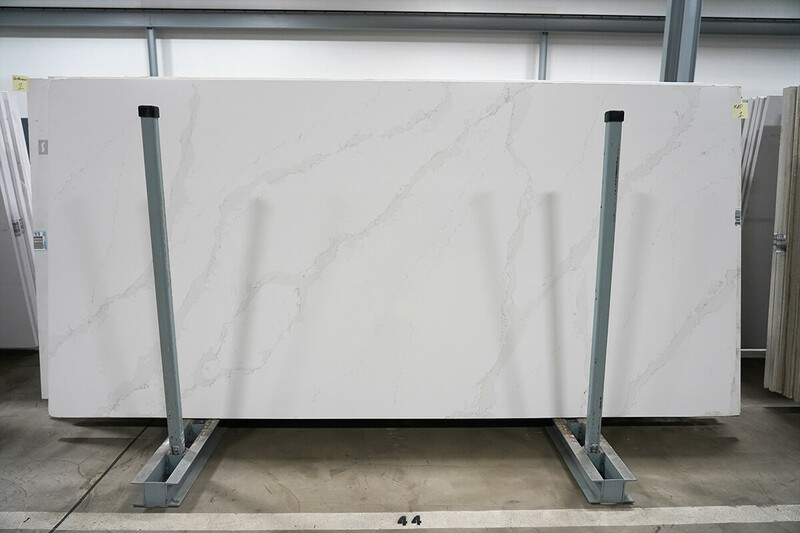 A Silestone Eternal Calacatta Gold quartz slab in the Cosentino Boston warehouse. Seeing it in person, I quickly realized the Silestone quartz wasn’t for us. It was beautiful, but there wasn’t enough veining, and with white kitchen cabinets, I was afraid of things looking too hospital-like. So I continued on my search. In total, I probably visited about 10 different stores, maybe more. I finally decided, with the help of my patient husband, on a quartz by Vadara called Calacatta Dorada. 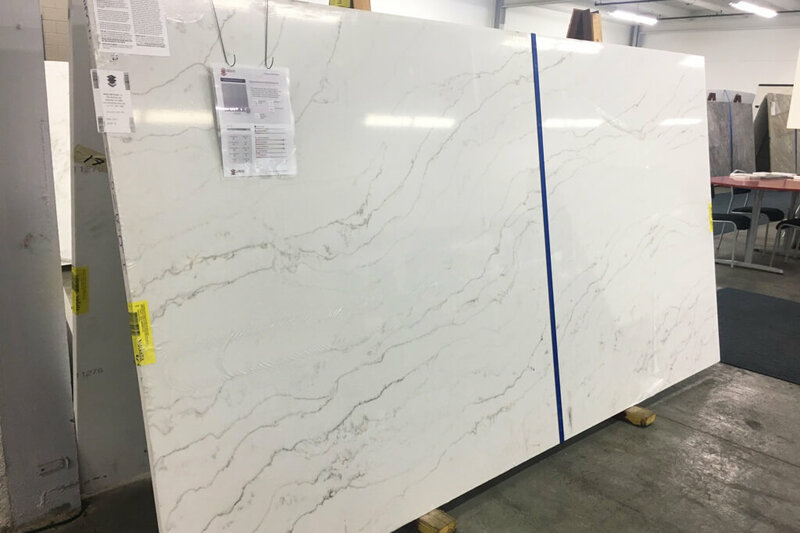 It has warm, thin veining throughout a white background and it will go nicely with the woods we plan on incorporating into our kitchen design (counter stools, accents, etc.). A slab of Vadara’s Calacatta Dorado quartz. While I’m not sure what the secret to combatting indecisiveness is (it feels like it’s ingrained in my DNA), I will say it’s helped tremendously when my husband declares what he wants, which was the case with the countertop. He saw it and just knew … or he was just having decision decision fatigue (see what I did there). The hubs and I a couple of weeks back when I was 34 weeks pregnant and it was still cold enough to wear sweaters and scarves. Tom and you should consider having a TV program on house remodeling. You would be good at it.